The Vancouver CanSing Youth Choirs will present the musical, TRICK ME ONCE, May 23rd, 7pm and May 26th, 7pm, Cityview Church (4370 Sophia St). Admission is by donation ($10 – $15.00 suggested amount to cover professional fees, rent, choir expenses). 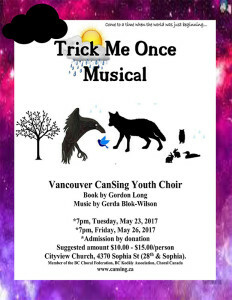 The musical play was written by Gordon Long (script) and six original songs by Gerda Blok-Wilson (music) in 2007 and has been performed by youth ages 11 – 18 for schools and communities. The choirs will also perform school shows 10:30am & 1pm, May 26th. “Come to a time when the world was just beginning!” Imagine what would happen if that legendary trickster from the Northwest Coast, the Raven, were to come face-to-face with his equally-sly counterpart from the Interior, the Coyote? What would happen if the two of them were entrusted with the weather? Is there even the slightest chance that they would get along? When it comes to messing up the weather, global warming has nothing on these two masters of tom-foolery, when they set out to trick each other, using the weather as their battle ground. Between the heat and the cold, the rain and the sun, when these two get rolling, nobody has a chance. Not even the audience! The show will be approximately an hour in length. We hope to see you! This entry was posted on Thursday, April 27th, 2017 at 2:29 pm	and is filed under Welcome to CanSing. You can follow any responses to this entry through the RSS 2.0 feed. Responses are currently closed, but you can trackback from your own site.